Yes, online research communities have their place. I ardently believe that there are many organizations that can benefit from structured online communities (MROCs or ORCs, as many now call them), or even just well-run, online customer advisory boards (link). In fact, there are some markets for which I think online communities can be one of the best ways of getting honest, objective customer insights. But let’s not oversell it; if we do, we’ll only cause a lot of heartache (and wasted research dollars). “And if you worry about whether these collections of consumers function like real communities on the Internet, you shouldn’t.” Well, I think what the author meant is that “some of them do.” But nobody thinking about funding (and we are talking about significant funding here) an online research community should assume they are guaranteed to have the same experience. Few communities have the defining bond that cancer patients have (the example cited in the Forrester blog). Some organizations simply don’t have customer bases so eager to connect with peers for experience sharing, support, etc. Some do—there are some brands that have very passionate customers (Apple comes to mind). So be real: does your organization have a customer base that will be self-motivated to participate? Does your product category engender “team spirit”? 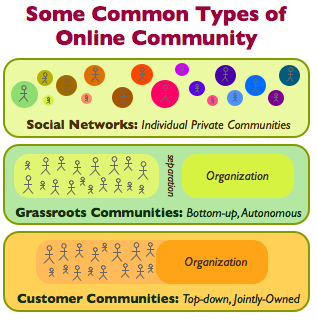 If so, great; online communities may be realistic for you. The statement, “But research communities can do things no other form of research can do. You can ask follow-up questions to get clarification or more detail. You can look at the profiles of members, to put their questions in context”, is factually incorrect. You can do that with most types of research. Doing focus groups or interviews? You can easily ask for more context or follow-up clarifications, and do so with the benefit of reading body language (follow-up is also feasible for surveys, though the response is generally not real-time). Any half-decent researcher knows to gather contextual information (either for focus groups, interviews or survey projects), and in many cases the screening process uses techniques to ensure this context is valid. Doing online research? There are most certainly tools available that allow you to do real-time probing; two that come readily to mind are Invoke Solutions and iModerate. Yes, online communities can do these things too—but to say “no other form of research can” is simply untrue. Online Research Communities have a place. But whenever we gather customer insights, or insights from the broader market, we always need to first ask, “What are the objectives? What do we want to learn? What will we do with this data?” The answers to those questions will drive the key decision about best methodology. Should the research be “blind” (the sponsor kept anonymous to avoid bias)? Should it be quantitative? Is directional insight sufficient? Should it be done in one country or many? Should it include our customers and/or competitors’ customers? Only then can you pick which tools, or combination, will be the best choice for your market research dollars.